Ferret Training Tricks - How To Train Your Ferret? Positive encouragement for the behaviors you wish to enforce usually comes in the forms of treats or attention. 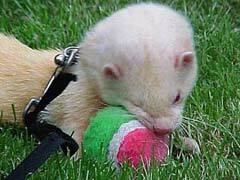 In early stages of ferret training, reward actions close to the one you wish to encourage. For example, when the ferret gets in his litter box, reward him. If he tries to relieve himself in a corner other than his litter box, move him into the box and reward him for being in the box. The ferret should soon learn that going in his litter box is a good thing. Negative reinforcement should be firm, and easily recognizable as going with specific actions. Some owners take advantage of wild ferret facts, and will put pressure on the scruff of the neck where a mother ferret might. When a ferret is playing too rough, taking away his ferret toys or simply ignoring him can be a very effective punishment! Once you have mastered the basics of ferret training, other tricks or actions can be taught easily. If there are specific ferret supplies you wish them to use, or ferret names you wish them to respond to, these are tricks that can be taught by simple negative and positive reinforcement—and a bit of patience.